Are the Pioneers becoming the "Saints" of Mormonism? The church has celebrated the 150th year since the arrival of the Brigham Young into the Salt Lake Valley. My ancestor, Henson Walker, Jr. was in that company. Another relative was in the now famous Willie Handcart Company*. It appears after hearing talks in Sacrament Meeting this year honoring the Pioneers, that something close to an early cult of the Saints is developing around them. We now sing songs of adoration and veneration to the blessed and honored Pioneers. We are told that the Pioneers still benefit and bless us today, not by their prayers, but by the actions they took while in this life. I couldn't help but see the similarities in the veneration of and devotion to the Pioneers and the traditional Catholic veneration of the Saints and Martyrs through the ages. 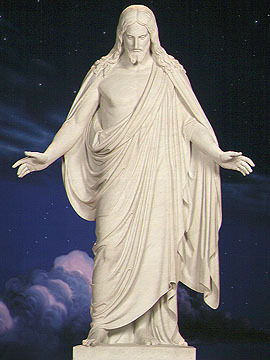 With the introduction of statuary art forms after the 1964 World's Fair (the Visitor's Center Christus) and little statues of Christ, Joseph Smith, Brigham Young, Nephi, Moroni, and others (made and sold by the "silversmiths" of Zion) appearing in Mormon homes, as well as paintings of scripture scenes appearing in Stake Centers and Ward Buildings, the outward differences between Mormonism and Catholicism are narrowing especially with what appears to be a growing veneration of the Pioneers and martyrs of the early Mormon era. "Israel, Israel, God is calling," we often sing, "Babylon the great is falling." But we have taken our stand between them; Brigham Young speaks of Latter-day Saints who want to take Babylon by one hand and Zion by the other--it won't work. Since World War II, it seems that we have been steadily converging with Babylon while diverging from some of the old teachings. Latter-day Saint children of the rising generation have never heard of their Guardian Angel, or of the recording of our every deed in a book in heaven; they were never told as we were as children that "it is a sin to kill a fly," and have never heard that satirical little verse which General Authorities used to quote in stake conference: "Money, O Money, thy praises I'll sing! Thou art my Savior, my God and my King!" That would be quite unthinkable today, a kind of sacrilege. Because some of the old teachings are still preserved in the temple, certain anomalies appear to the younger generation. *Why we venerate people that poorly planned their journey and suffered the consequences, I will never know. If a group of people today, left for a cross-country trip in a poorly running car with tread-bare tires, late in the season when bad weather was possible and some of them died, wouldn't we just shake our heads and express sorrow at the loss of life? We wouldn't venerate them or make them heroes but we would vow not to make the same mistakes ourselves.